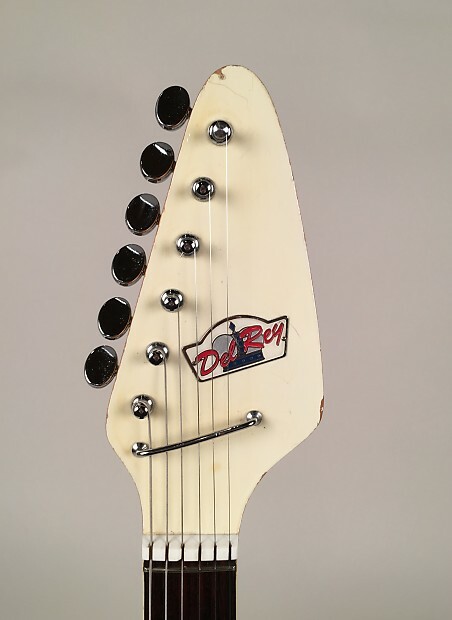 The so–called monkey grip has been a key, defining feature of Steve Vai’s signature Ibanez since the late ‘80s, but Teisco beat Ibanez to the punch as early as the 1950s. 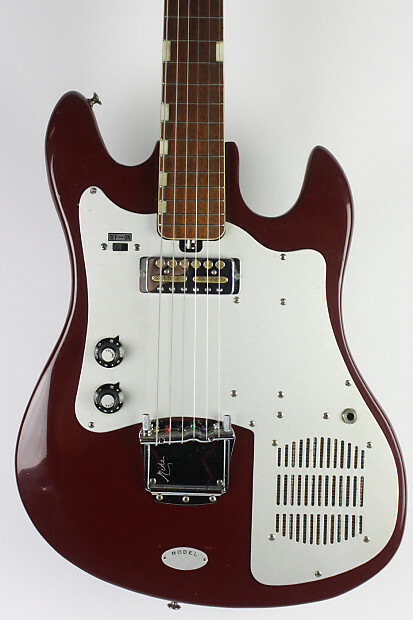 The 1960s TG–64 was a top tier model for Teisco, though it falls just a little short of the spectacular Spectrum 5s. The TG–64 can certainly be a player, with nice pickups, a great vibrato arm, and some very cool sound selections via the three rocker switches and tone cut control. These guitars feature an offset body shape that should appeal to Jazzmaster or Jaguar players looking to add something a little different to their arsenal. 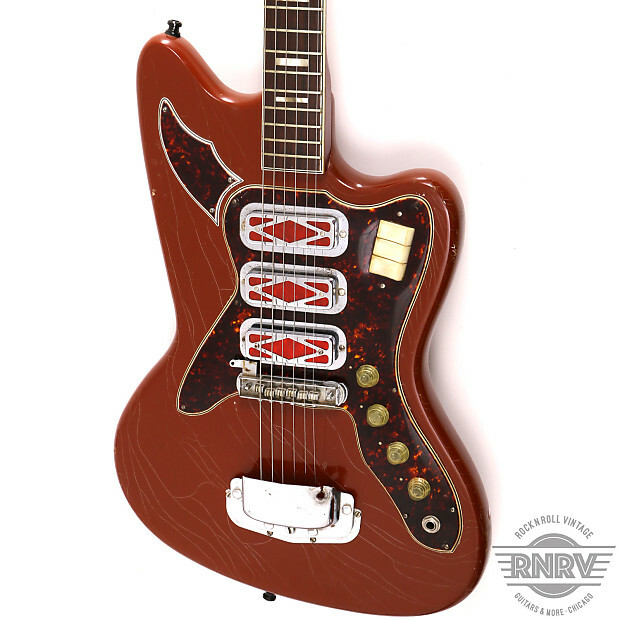 This Mid 60’s Teisco Del Rey ET-2T. New nut, new jumbo nickle frets, and not one but two sets of hand wound pickups done by Brian Goez of St. Louis for Howlin’ Music. A couple of bumps n bruises, but in very solid condition. 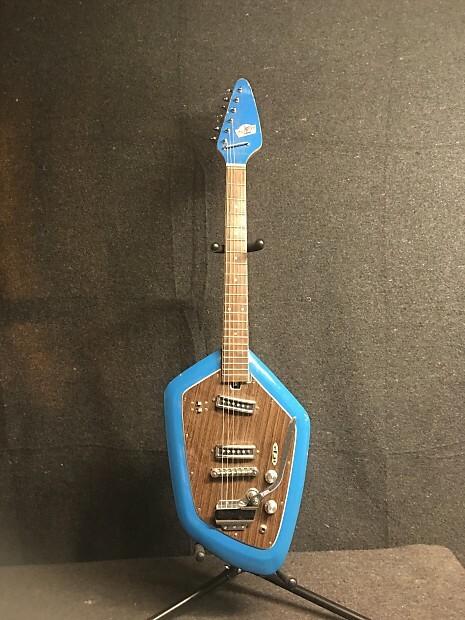 Fun guitar and Cool!! These old Silhouette’s are some of our favorite Silvertones. This one has three red holofoil covered pickups that are cooler than cool. We’ve had the blue ones before but this all red look is amazing. They sound as good as they look too. 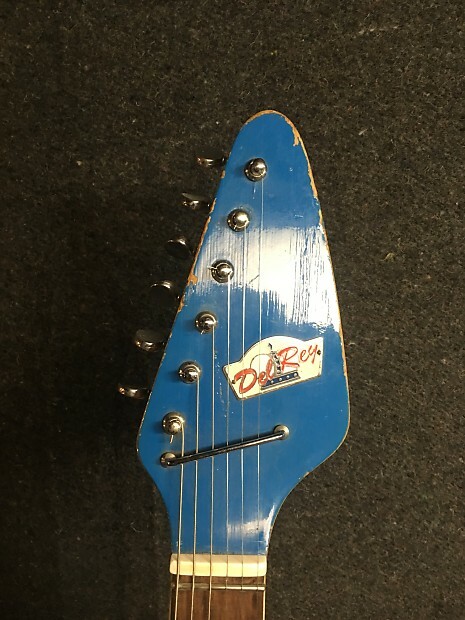 This one has a shim in the neck to make it as playable as can be. Frets are in great shape. Vibrato arm is long gone. Upgraded tuners. The finish on the body and neck don’t quite match, can’t be sure if it left the factory like that or if the body was over-sprayed after the fact or maybe the neck was never clear coated. 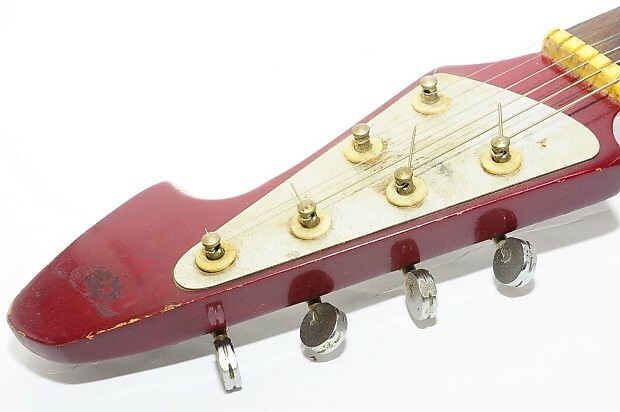 Lots of these old guitars can be quite as mystery as they were building them on the cheap and as fast as they could ship them. 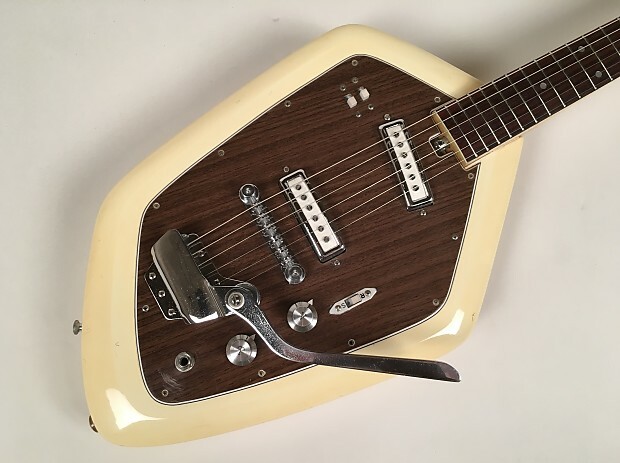 This 1969 Teisco EV-2T dual pickup guitar comes in a hard to find aged white.This guitar is from an extensive Teisco/Silvertone collection we have the honor of listing. 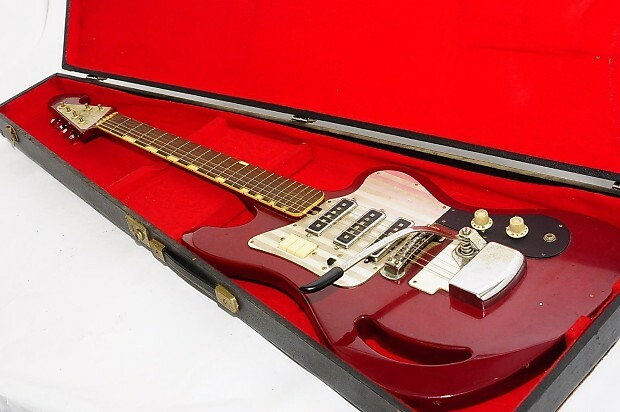 Towards the end of the 60’s, Tiesco/Kawai found short-lived success with copies of well-known guitars, this being a mimic of a Vox Phantom (another fave of ours!). This model sports a three-ply woodgrain scratchplate (think station wagon panel! 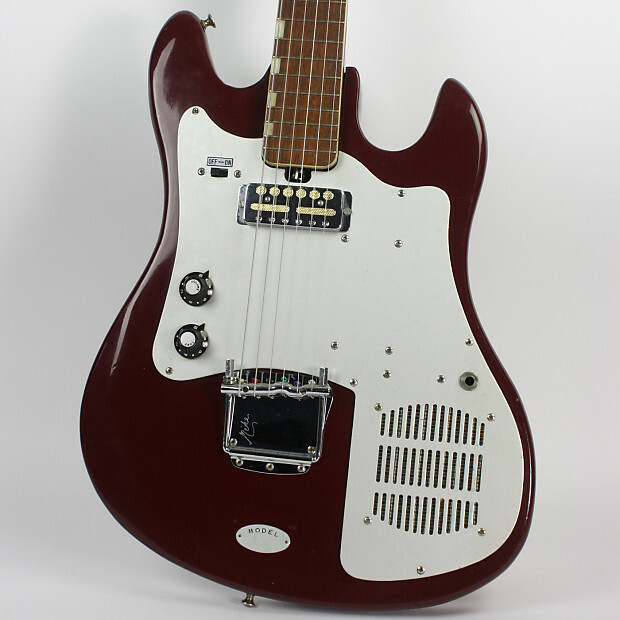 ), 2 of Teisco’s signature single coil PUPS in white and an adjustable roller bridge. 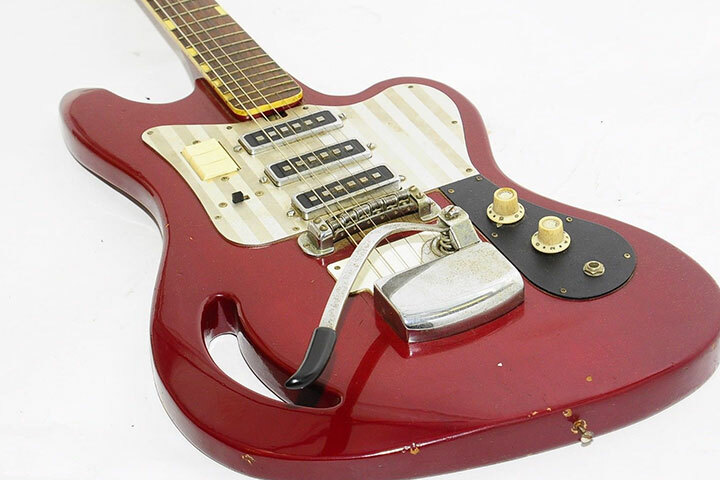 This guitar is another Teisco/Kawai staple that would complete a collection! This guitar has its dings and scratches, as these guitars were usually abused and/or discarded of, but it plays great and is fully functional. 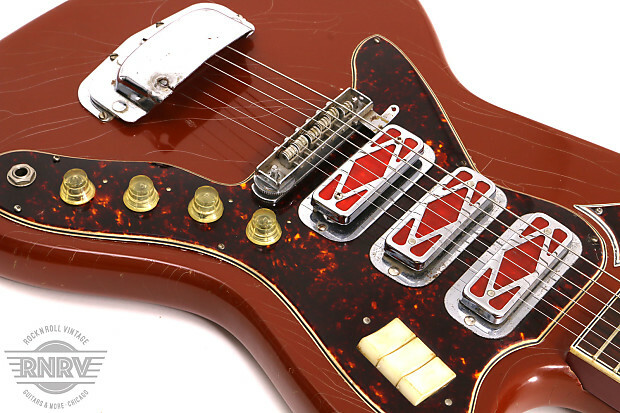 Teisco was a Japanese budget brand that produced several guitars for the Sear’s Catalog through the 50’s and 60’s. Comes with gigbag.Their guitars & basses have become quite sought-after as collectibles in the last few years. At times ethereal and ambient, at others dystopian and aggressive, Ed O’Brien’s contributions to Radiohead’s catalog have been as unique as the man himself. When he needed a guitar that could go above and beyond the normal requirements of the instrument, he chose to create something all his own. 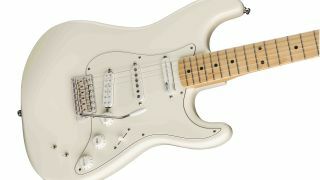 The result is this: the EOB Sustainer Stratocaster. Ed O’Brien’s ambient, ethereal and orchestral guitar style is an essential part of the sonic identity of Radiohead. We partnered with this groundbreaking player to create the Ed O’Brien Stratocaster — an instrument as unique as his sound. This inspiring guitar is perfect for creating lush, layered soundscapes and finding your own creative voice.